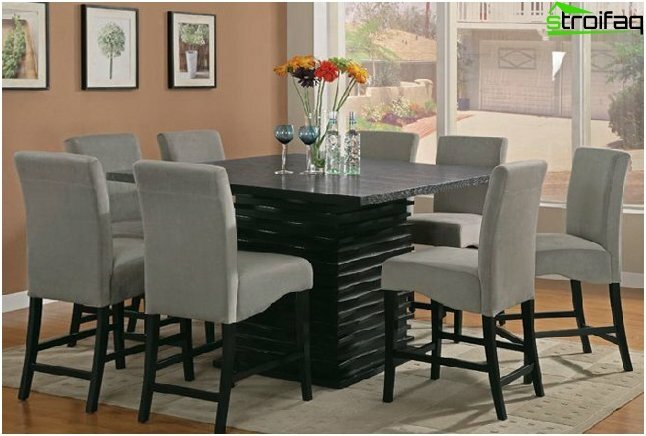 Where to place a dining table? What form the table to choose? 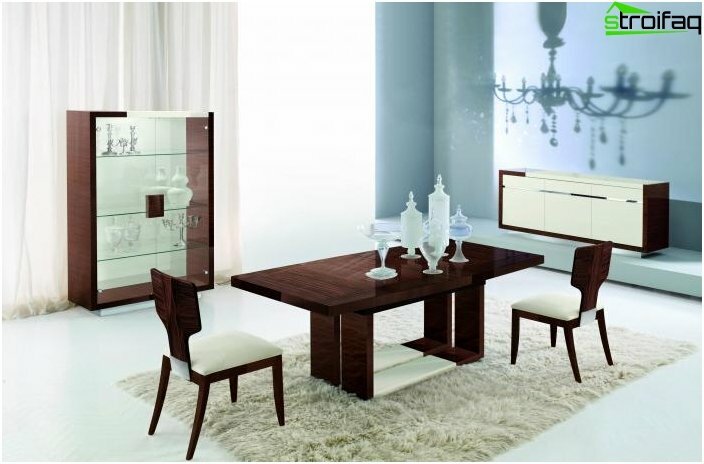 The dining table is desirable to have, where you are planning to communicate with their guests. 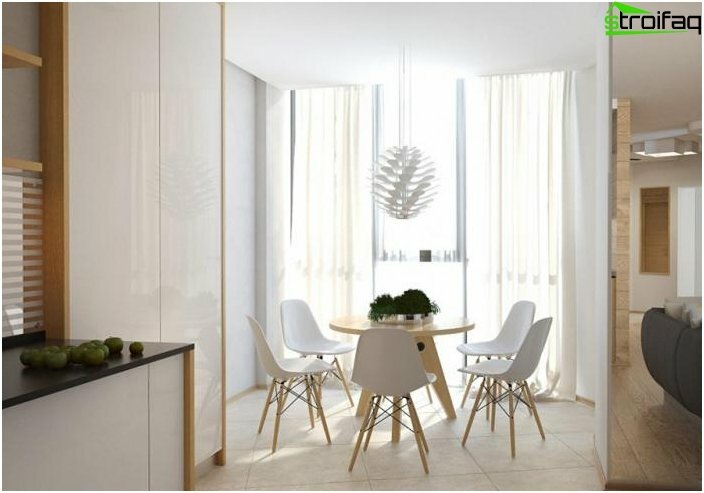 This can be a kitchen or living room. 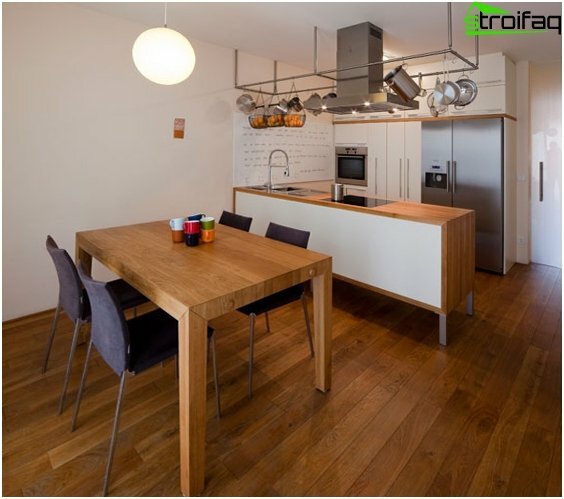 Placing the dining table in the kitchen - it isthe standard version of the interior design. Of course, much depends on its size. 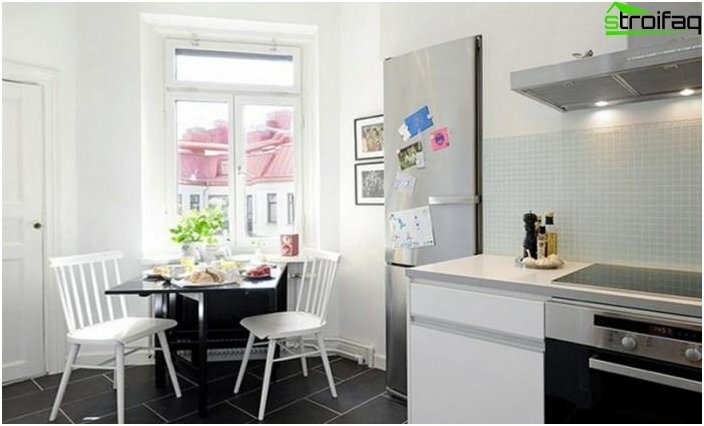 In a small kitchenette hardly it fits a large and spacious desk, most likely, it will be calculated on the number of persons from two to six. 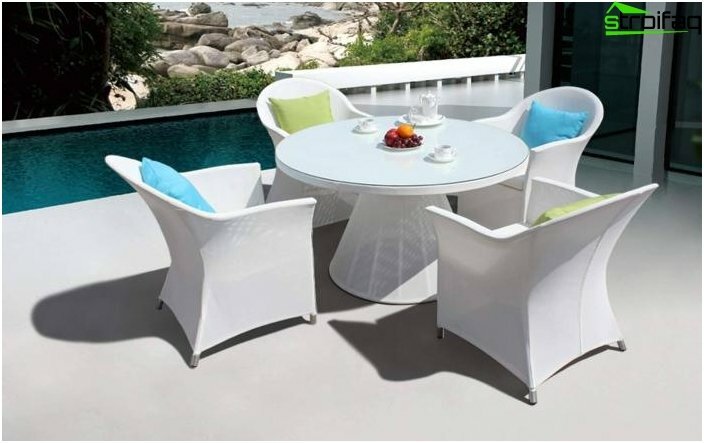 For this table, not only and not so much to receive guests as breakfast / lunch / dinner in a small family. 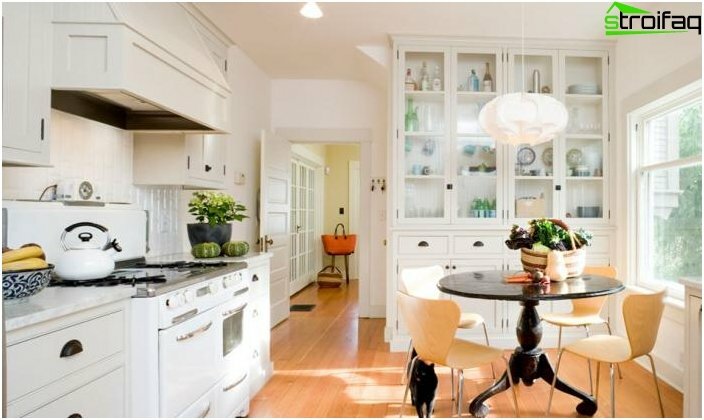 In addition, it can be used as a kitchen table cooking. 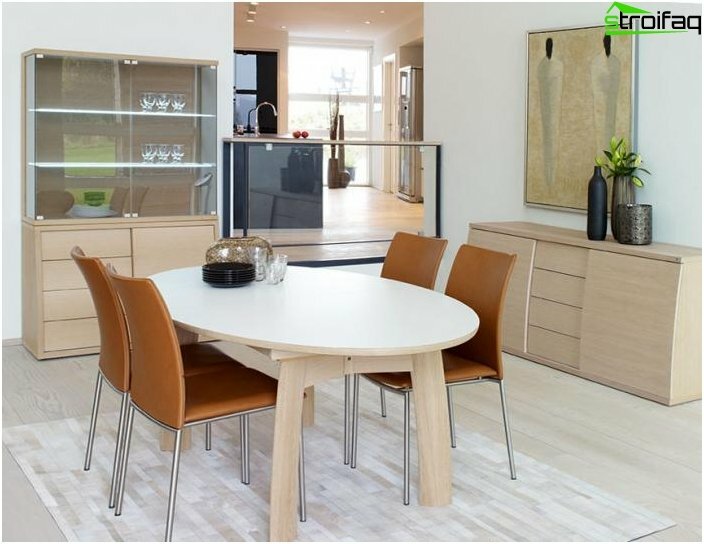 To receive a dining table in the kitchen can be used only if there is sufficient space. 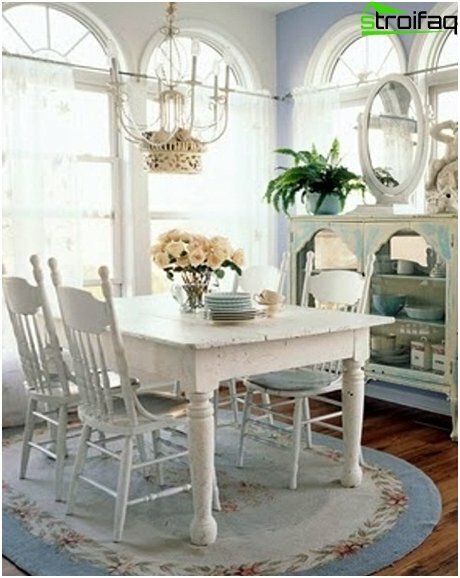 Otherwise - it is better to put somewhere in the corner table in the kitchen, so it does not interfere and make it to the room if needed. 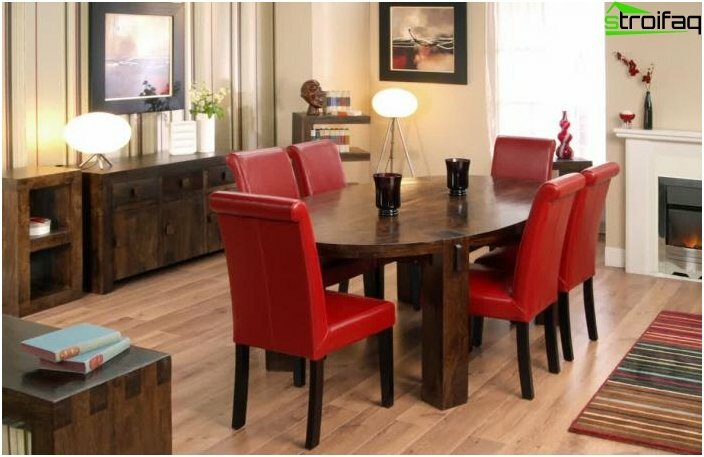 Placing a dining table in the living room, The less likely that it will beused as a work surface and will be less prone to all sorts of contamination. 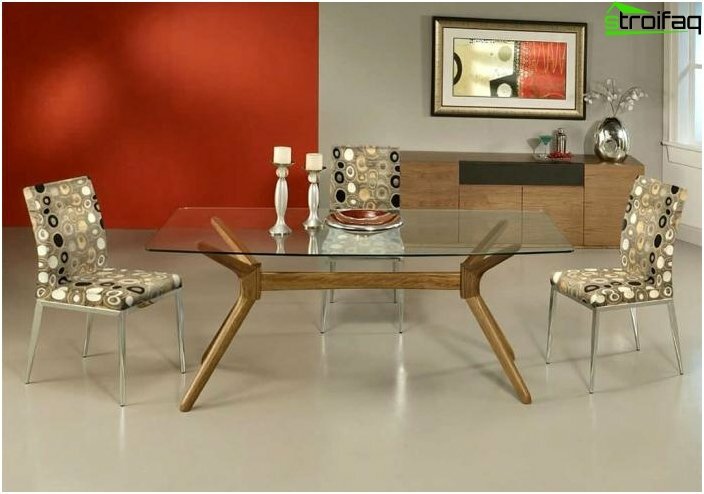 Therefore, this table can be not only a spacious and functional, but also to perform a decorative function. 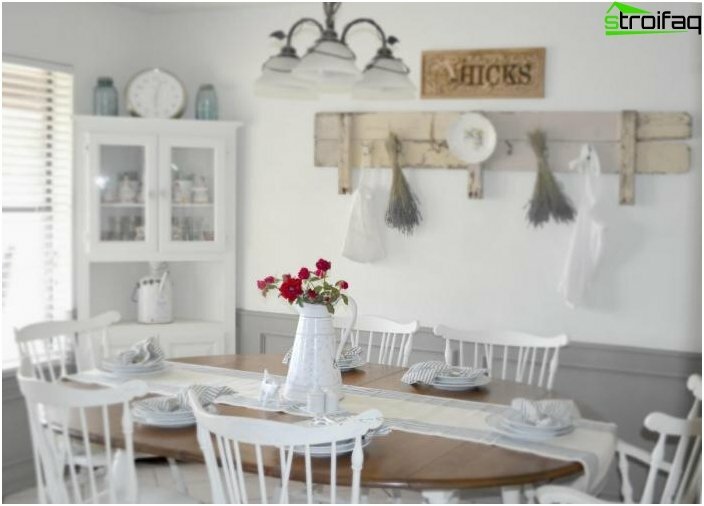 It can be non-standard forms of unusual materials, or just be decorated with beautiful elegant tablecloth with napkins - it all depends entirely on your tastes, preferences and fantasies. 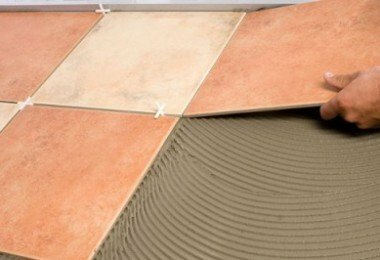 Each of these materials has both advantages and disadvantages. Let us examine them in detail. 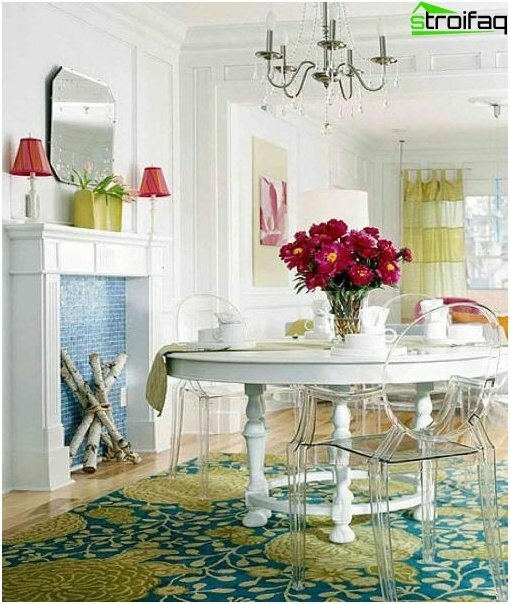 Glass tables - light, weightless, notcluttering space. They perfectly fit in almost any room. 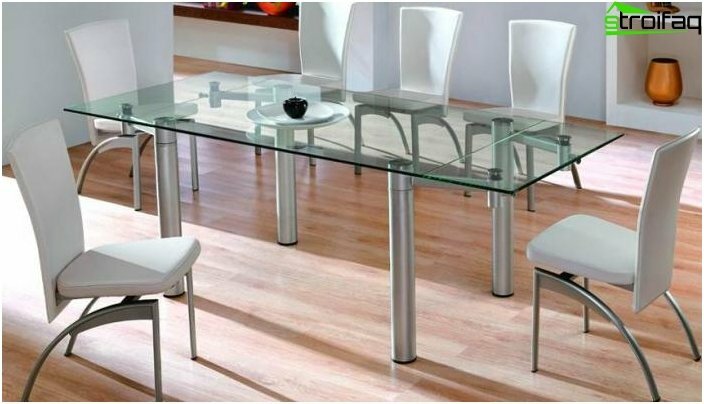 Table with glass top will look favorably in a minimalist style, high-tech, industrial and futuristic. 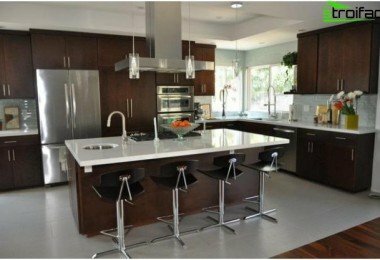 For glass top should be carefullytake care, because on the surface of most minor stains visible spots, and even fingerprints. At the same time you need not only a rag, but also special products for glass care - the only way you can achieve brilliant results in every sense. 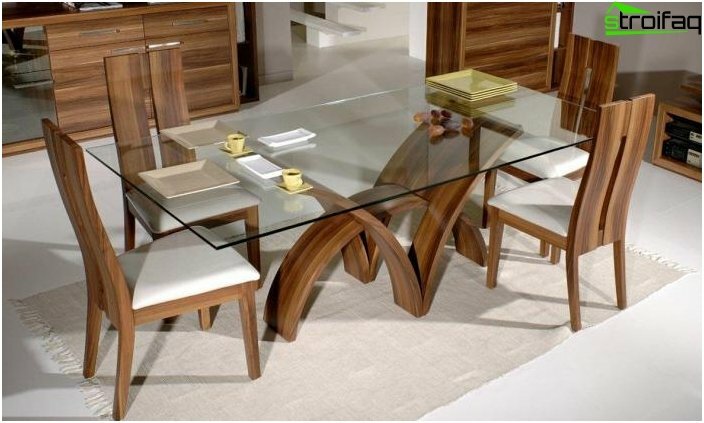 The surface of the glass table is cool to the touch, it is not always and not everyone is pleased. 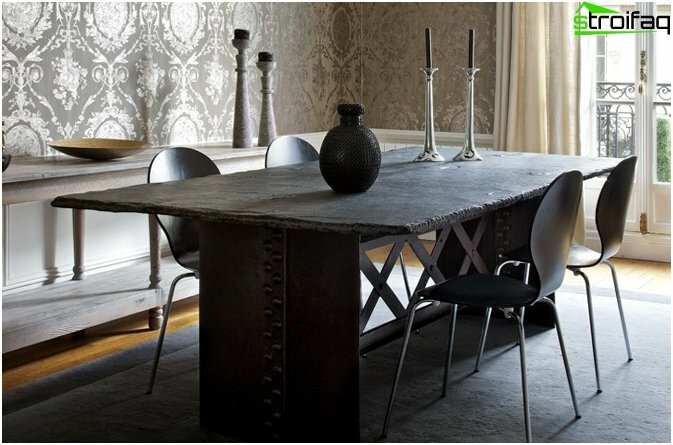 Glass table, in contact with hard objects (and them in the kitchen a great many!) Produces a very specific sound. Transparent surface. Yes exactly. The advantage comes at the same time a disadvantage, because not everyone will like to enjoy their own feet during the meal. 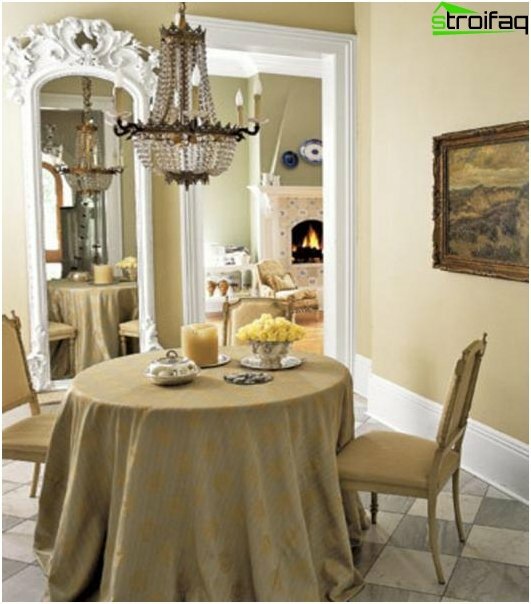 It makes no sense to buy a glass table, if you want to cover it with a tablecloth. 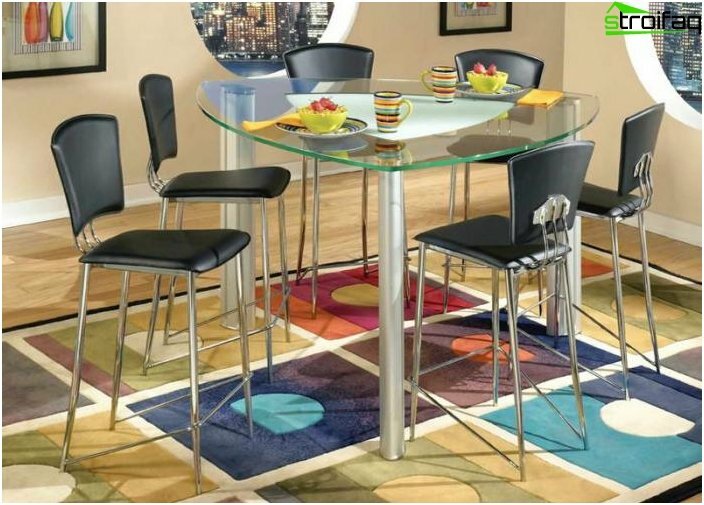 A compromise option could be a table with a top made of opaque glass. 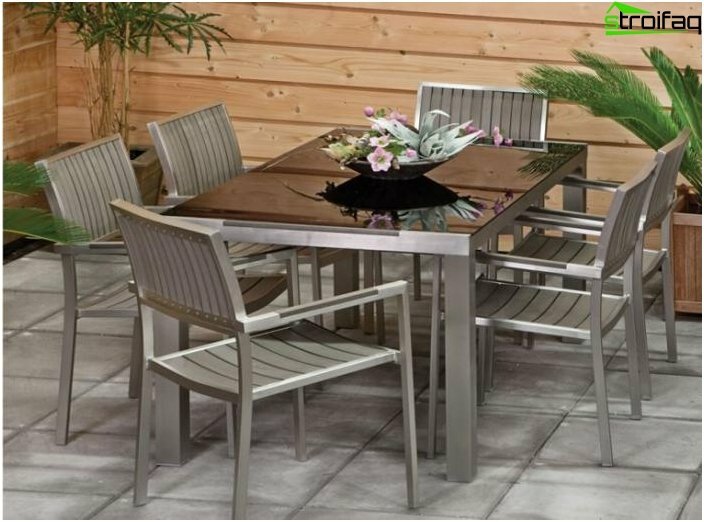 Dining metal tables are incredibly strong, andmodern models look stunningly stylish. However, this table will be quite heavy, so keep changing its location is very problematic. 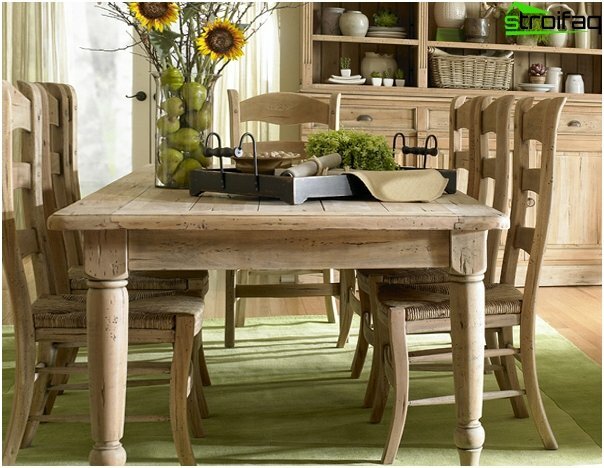 Wooden dining tables - is the choicetraditionalists and classics. 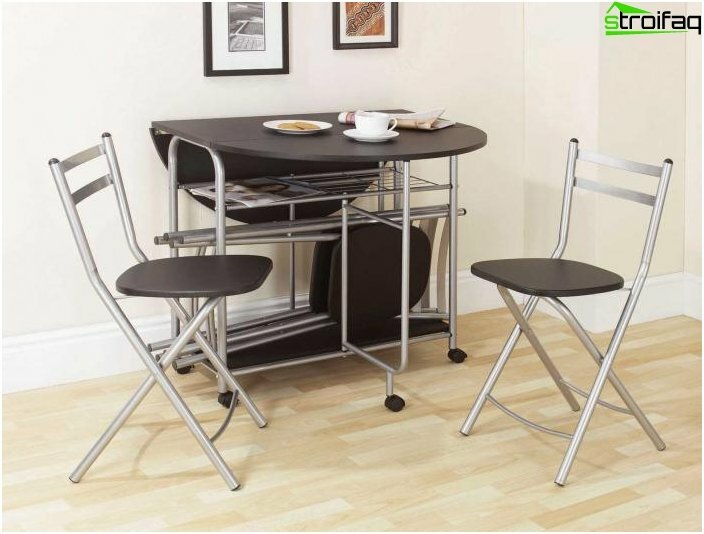 The cost of this table is quite high, and weight limits mobility. 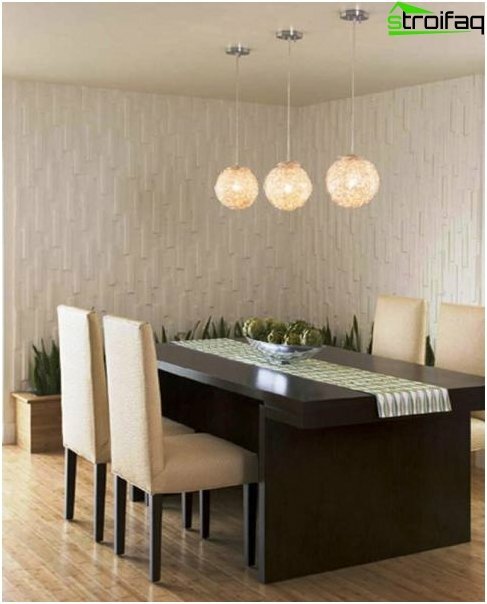 If the question rests in the price - you can choose a more budget option: a table with a top made of chipboard. 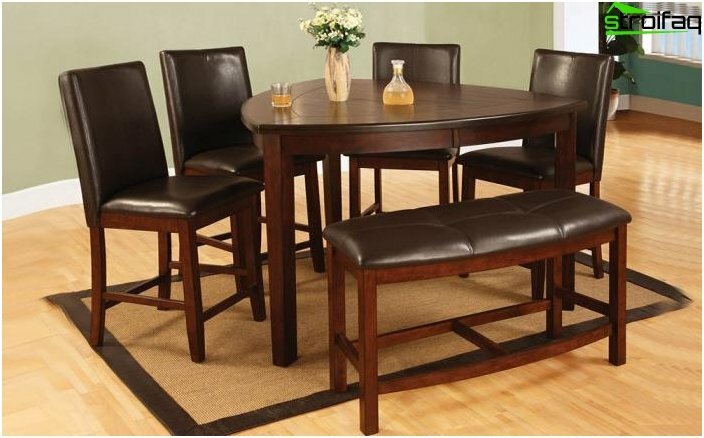 However, this table is unlikely to last you a long time. 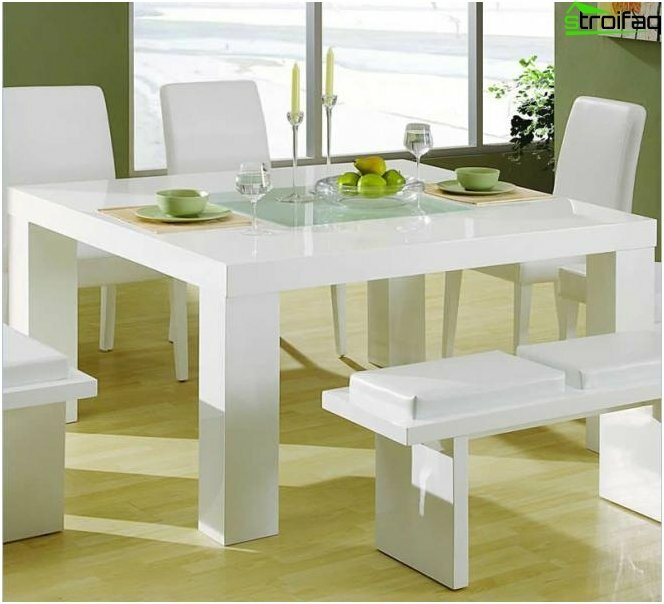 Plastic tables are the most inexpensive to purchase it will require minimum cost. 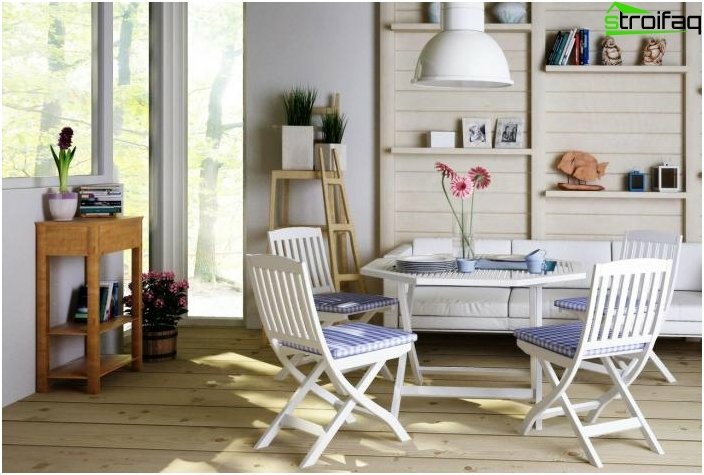 Plastic tables are easy to clean, so even stubborn dirt (which naturally arise during meals, and especially tumultuous feasts) you will not be afraid. 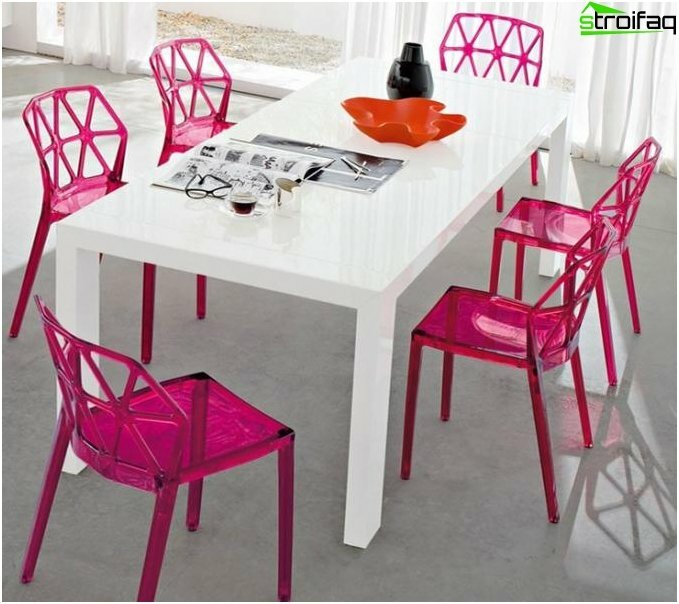 Plastic tables can be unusual and evenfantastic colors, because it is the most amenable to coloring of the material. 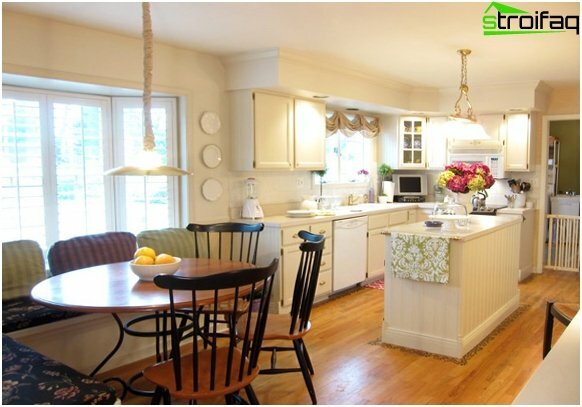 In addition, you can make custom countertop with photo printing, and your table will not exactly equal. 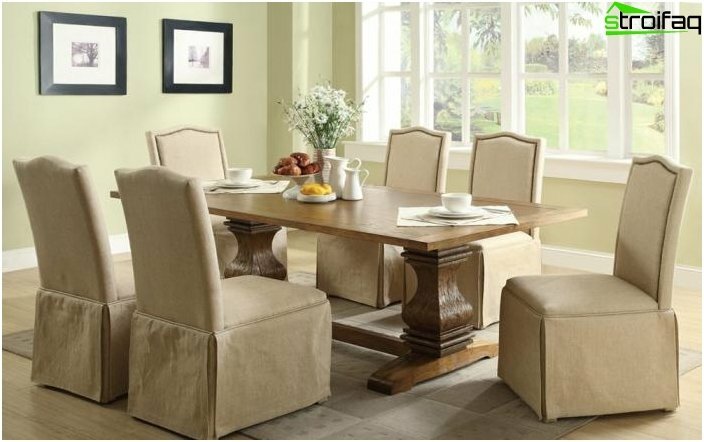 You have decided to buy a new dining table, but do not know what criteria to choose it? Our advice will help you! Decide where your table will be. 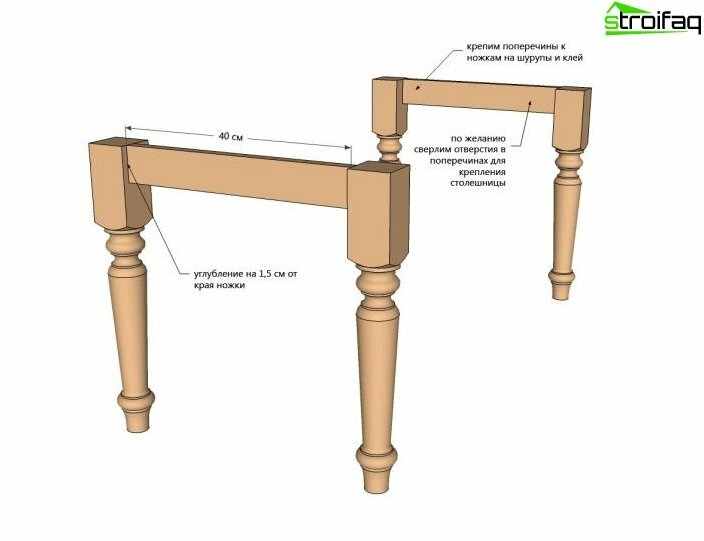 So you'll know exactly what the maximum allowable size should be at the table and what options already "not vlezut". Decide if the table needs to be moved from place to place. Because of this you will be easier to navigate with a choice of shapes and materials to the table. Decide how much you can be the guests andhow often they come to you. 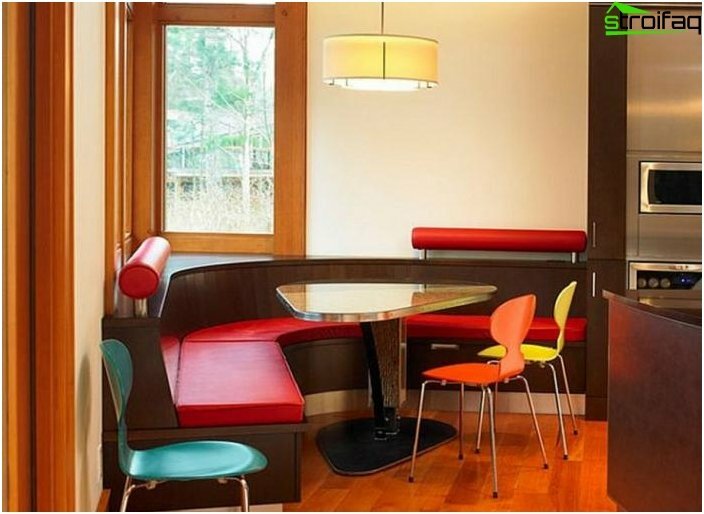 If your house is constantly reigns fun and noisy companies gather, you will probably need a large table. 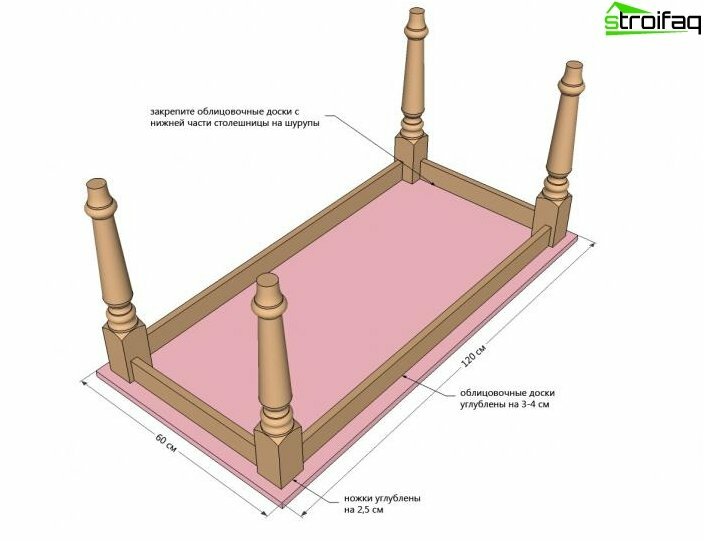 If the guests do not come to you often, you can restrict the table of calculation: all family members plus one or two extra beds. At the table with empty chairs trapeznichat notcozy, so buy a huge table for three people - not the right decision. 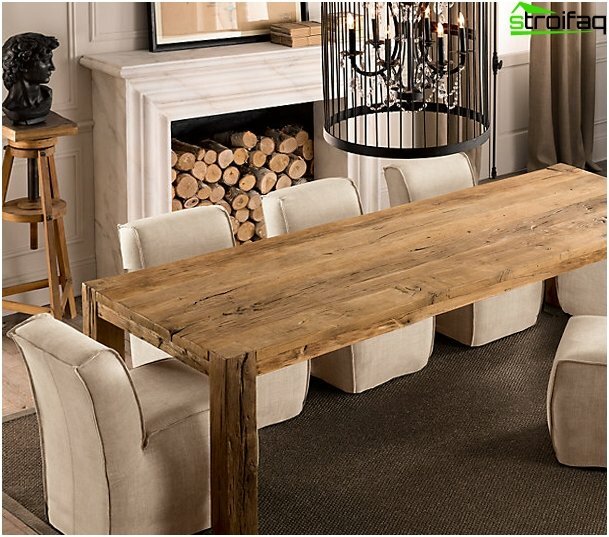 The best option - a table-transformer, which at any moment can be increased to the size of festive. 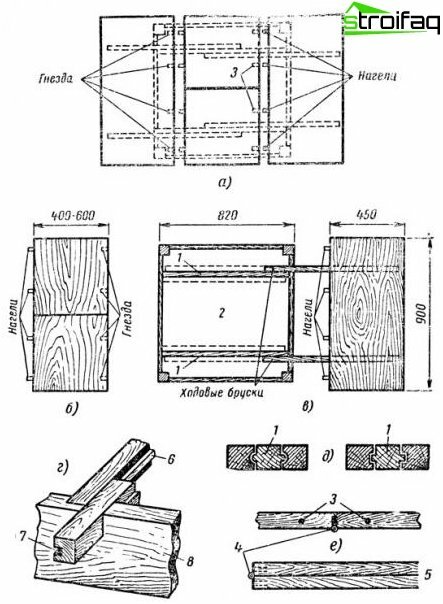 The rectangular shape of the table most. 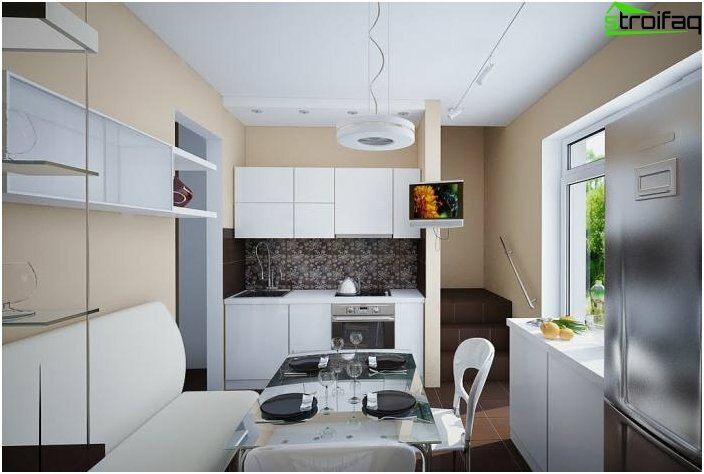 Common option not only for dining but also for the kitchen, coffee, writing, etc. 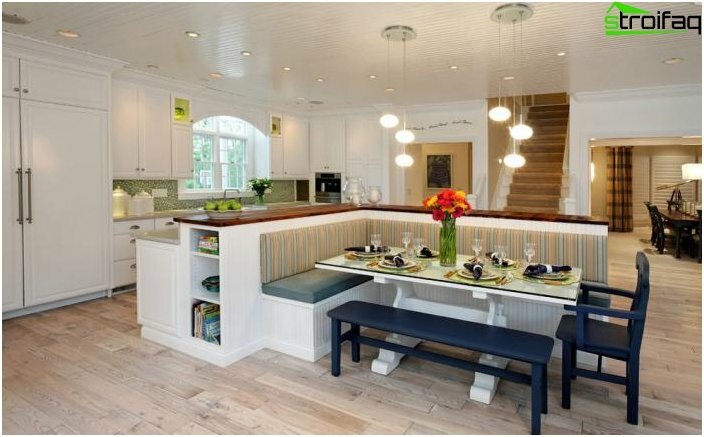 In terms of placement of a table is inferior except that corner, but the corner desks are designed for one (maximum - two) people, while at the dinner table is going three or more. 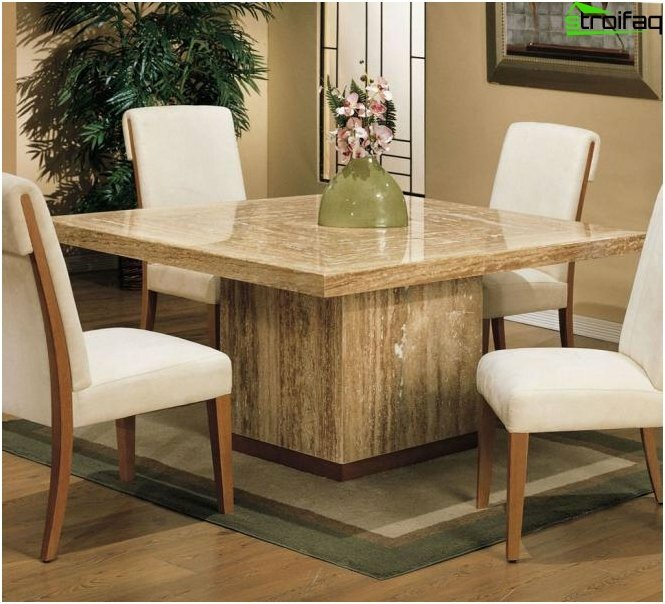 Rectangular table can be quite narrow: the width of the table top 75 cm is quite enough for comfortable placement of the dishes on the table and the people at the table. Too wide tables look too formal. 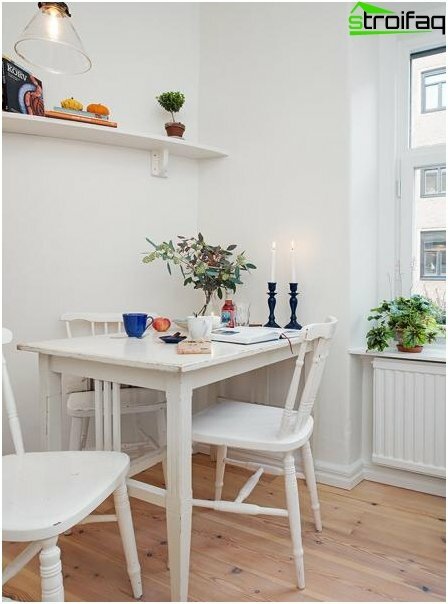 To save space, you can put a table against one wall, but at least one seat is lost. 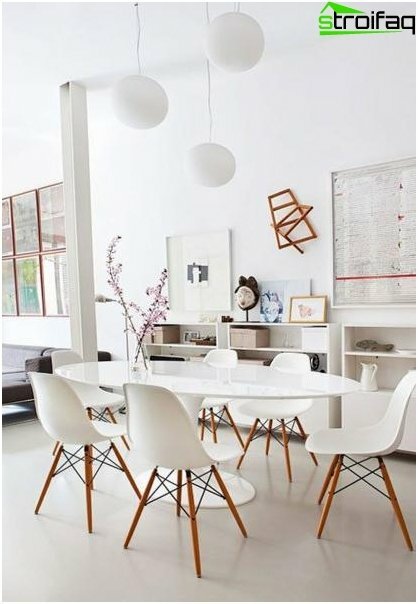 Oval table - a worthy alternative to the deskrectangular tabletop. It is no less capacious, but due to the lack of the number of seats angles easier to vary. 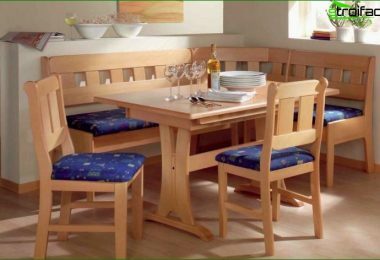 In addition, these tables are less traumatic, which is especially important for families with young children. 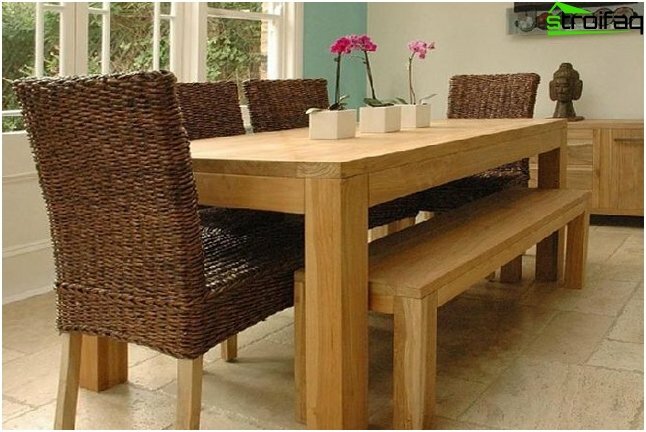 Choosing the size of the table, remember that the width of a seat at the table ranges from 70 to 80 cm (depending on guests' body). 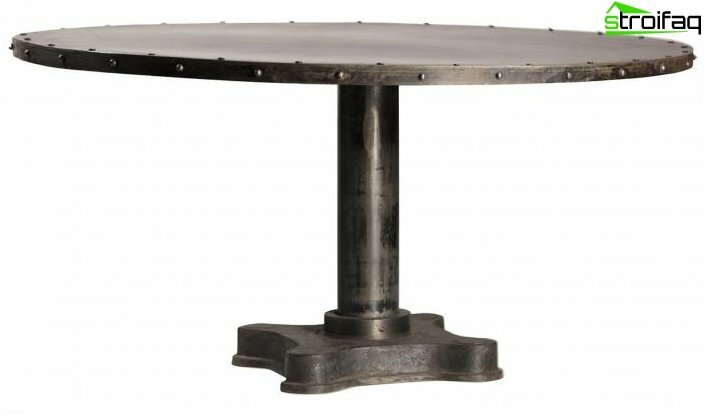 To table legs never stopped anyone, modern producers represent a wide range of tables on one leg, which is not only convenient, but also stunningly stylish look. The King Arthur and his knights of the round table was notchance: thanks to this form of the King stressed the equality of all in attendance. And really, if you want to create an atmosphere of trust - this is exactly what you need. At the round table, each person will be good to see absolutely all seated and less likely to turn into a holiday "kuchkovanie 'interests. 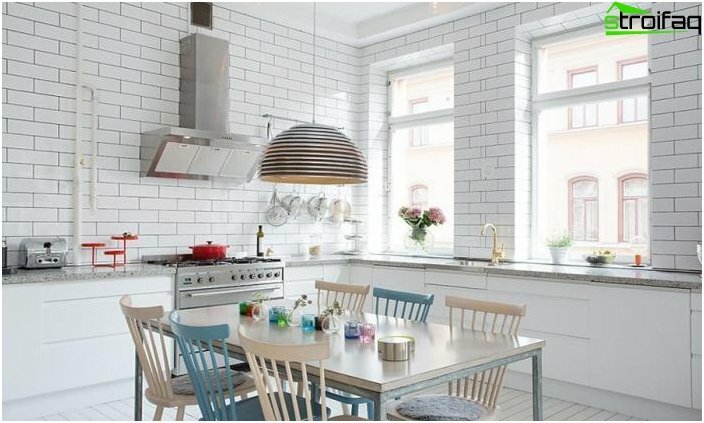 The streamlined shape allows to safely navigatefor a small kitchen, but the minimum diameter of countertop for convenient use (that no one was close) must be 95 cm, and given the need to put cooked food on the table - or even 120 cm. 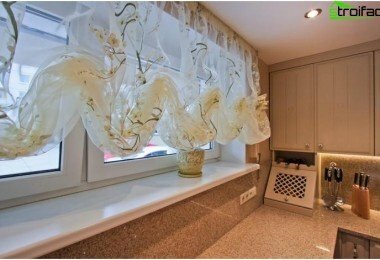 On the one hand, of a square table canput a large number of guests. And on the other - guests will be far from each other, which complicates communication and the transfer of food from hand to hand. 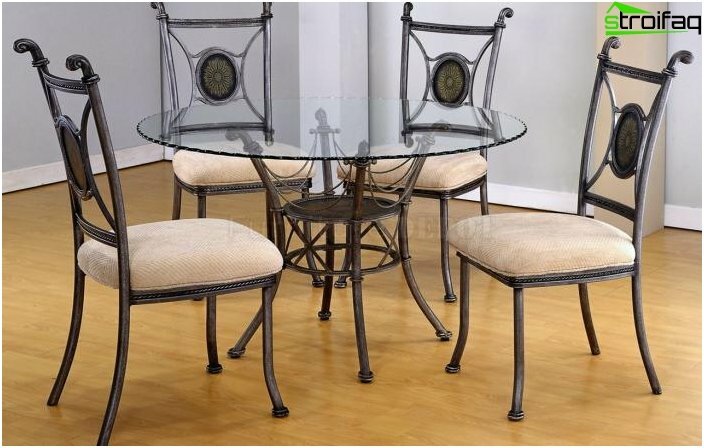 In addition, this table takes a very impressive space, so it is desirable to place only in a spacious room or kitchen. 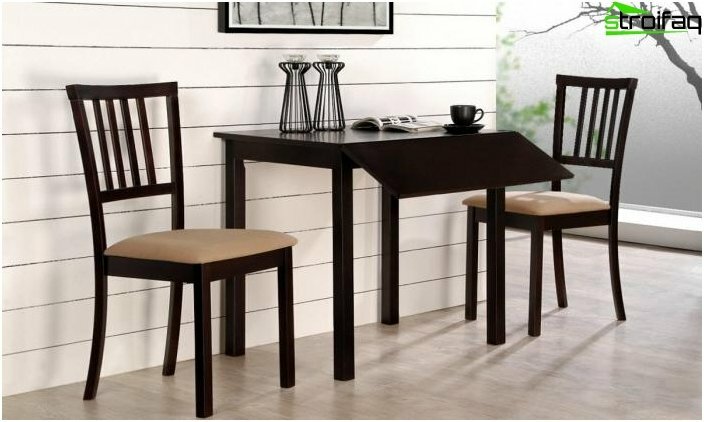 Small square tables are suitable for a family of two people. 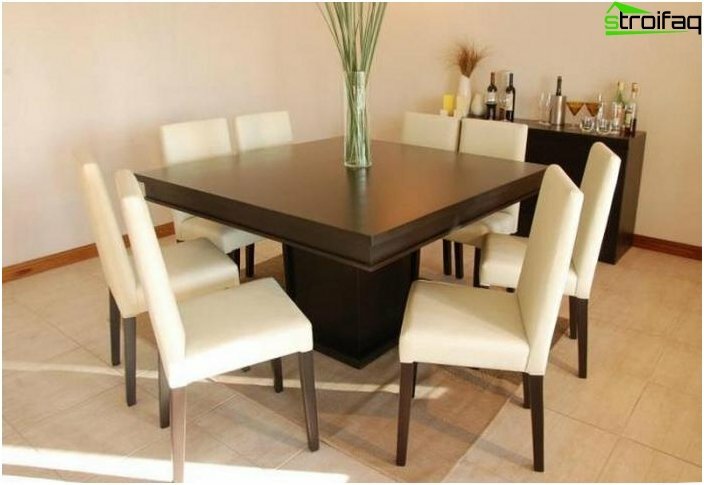 The optimal size of the square dining table for home use is a table for four or eight seats. 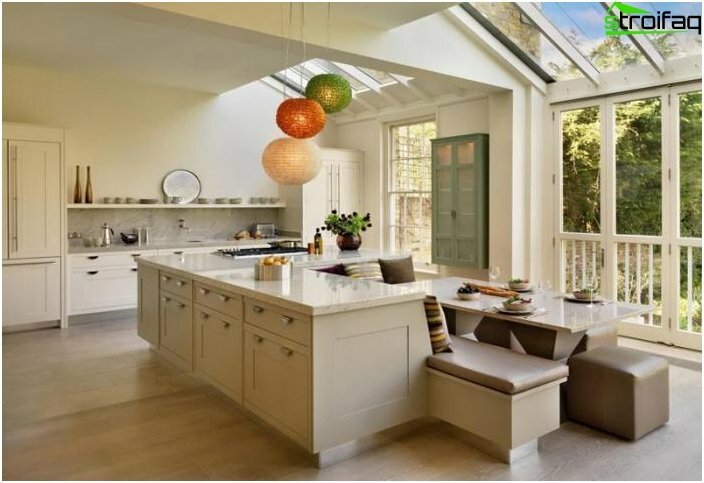 Calculating the size of the space to accommodatetable, remember that it includes not only the area of ​​the countertop, but also a place for the chair, which should be free to move away (to sitting person could get up from the table, not hurting others). His extraordinary, passionoriginality, the desire to shock the audience, you can express in the form of a table. 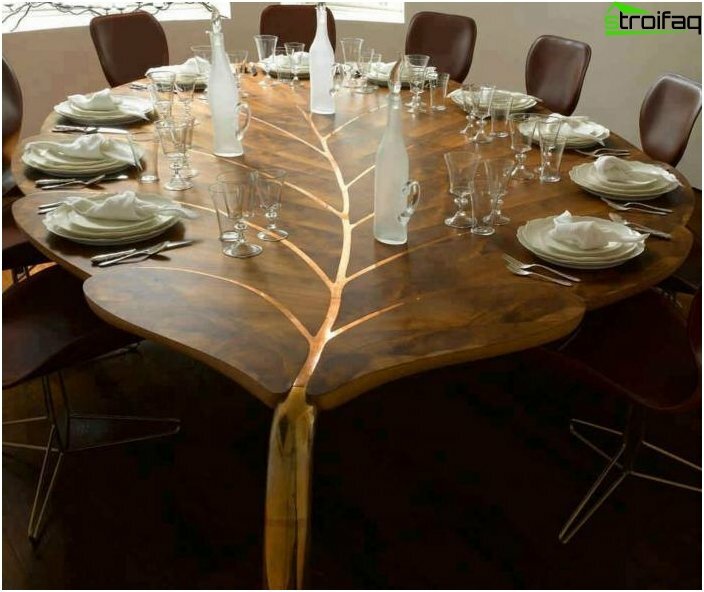 It can be a table top in the form of a triangle or a polygon, wave, leaf - anything. 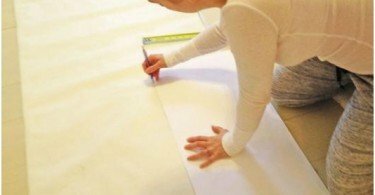 The main thing is to have enough space to accommodate your guests and that the invitation is not applied to injury, bumping into sharp corners. 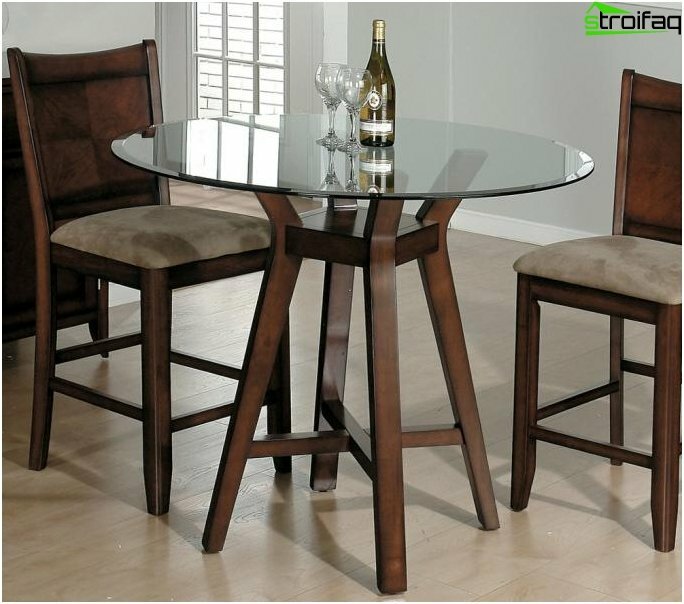 Perhaps one of the major achievements of modernFurniture industry - transforming tables. 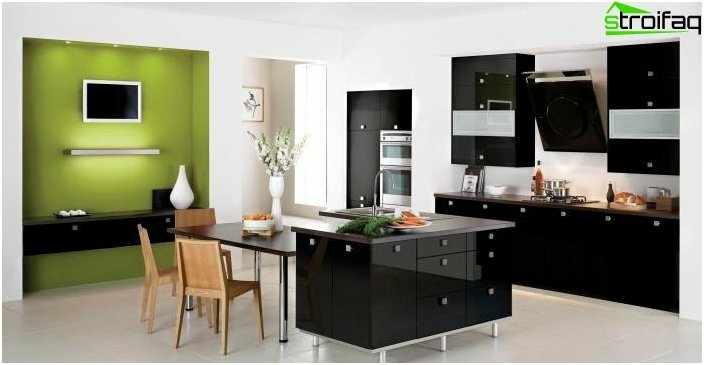 most of the homes do not differ such luxuries as a space in our country. 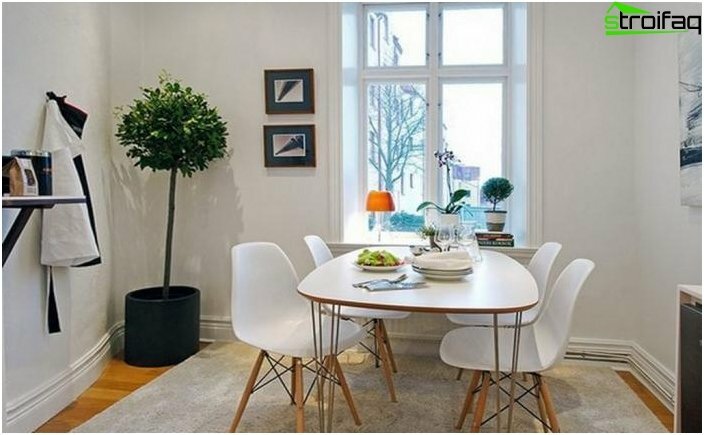 Therefore, the main task, which is when choosing a dining table: how to accommodate many guests during the holiday, but do not limit your comfort during the week? And today this is possible thanks to the tables transformers. 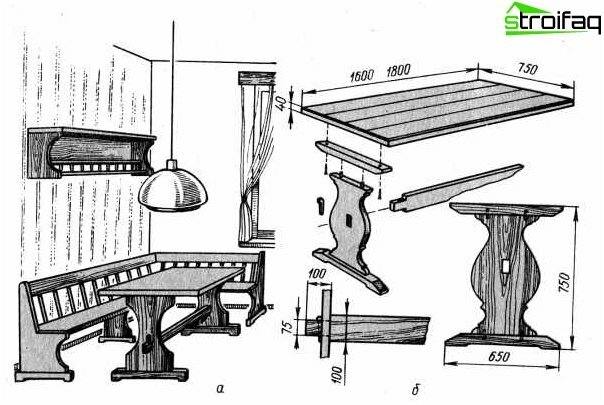 Transforming tables are of two main types: sliding and folding. 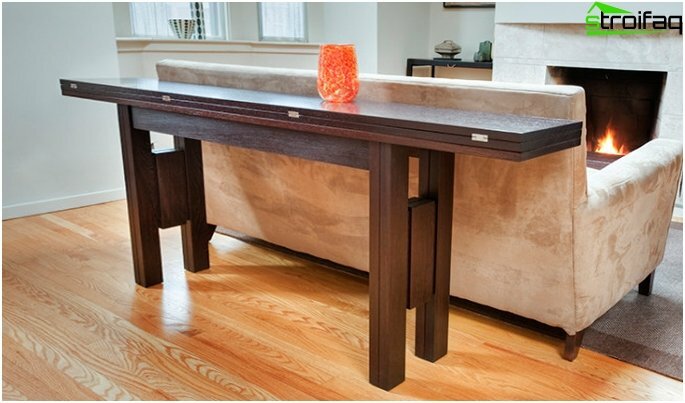 Sliding tables increase their area bycountertops, which can be separated and "deliver" another part. 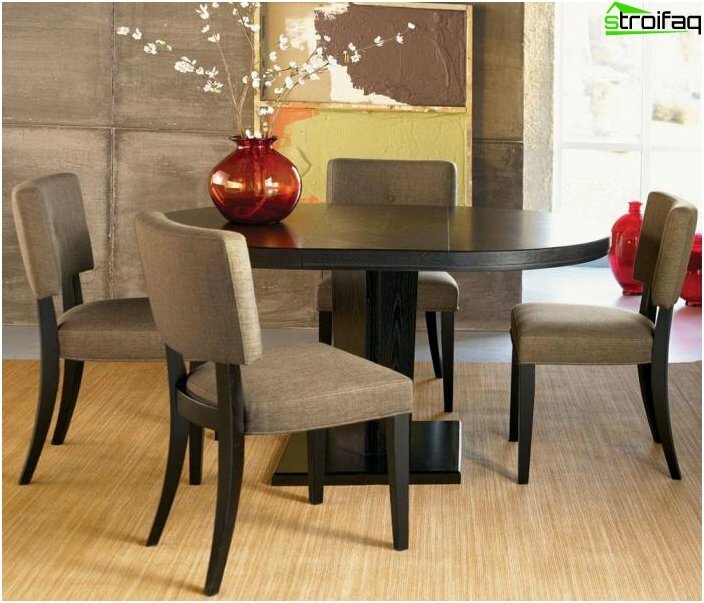 When folded, the tables are very small standard size, and also used as a dining table. 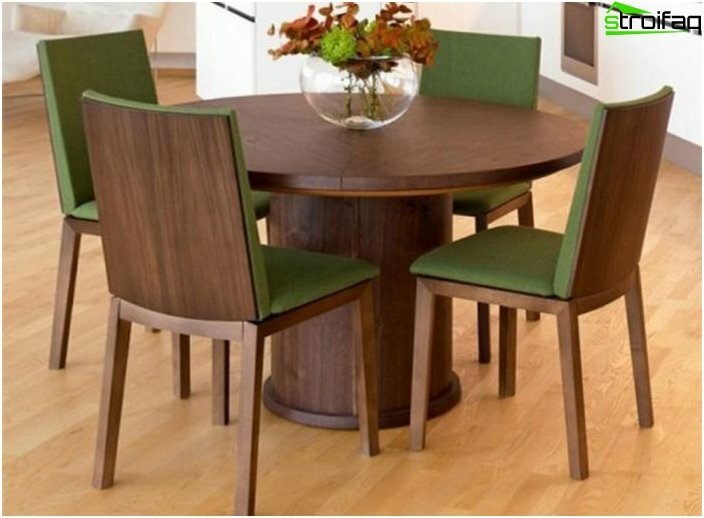 The most common form of rectangular or oval table tops. Folding tables more compact. 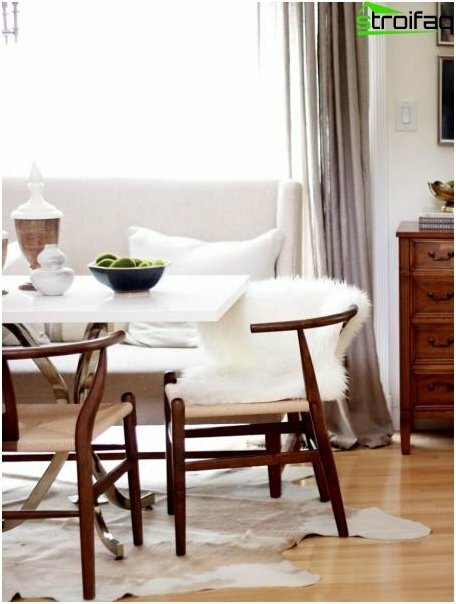 In contrast to the sliding, they folded can serve as a coffee table or bedside table (eg, table-book). 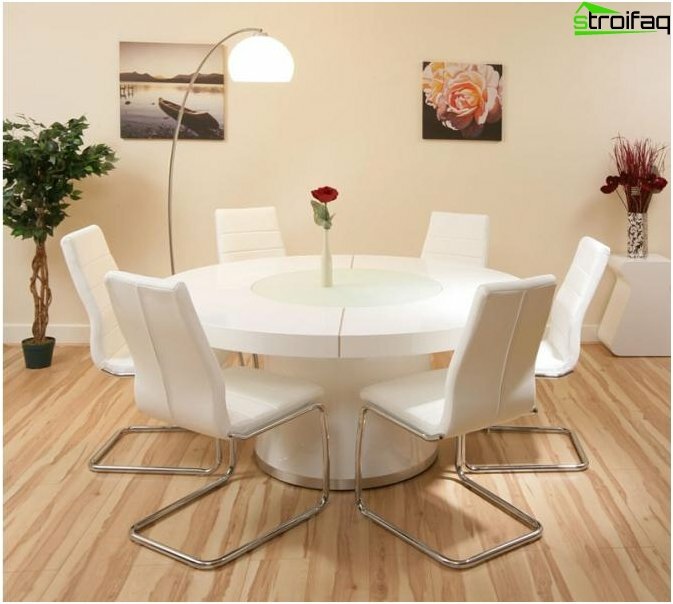 These tables are lightweight and mobile, they can be moved from room to room without much effort. 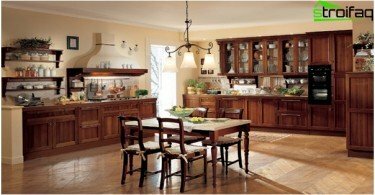 Select table small kitchen - Not an easy task. But does not solve the world's problems do not exist! 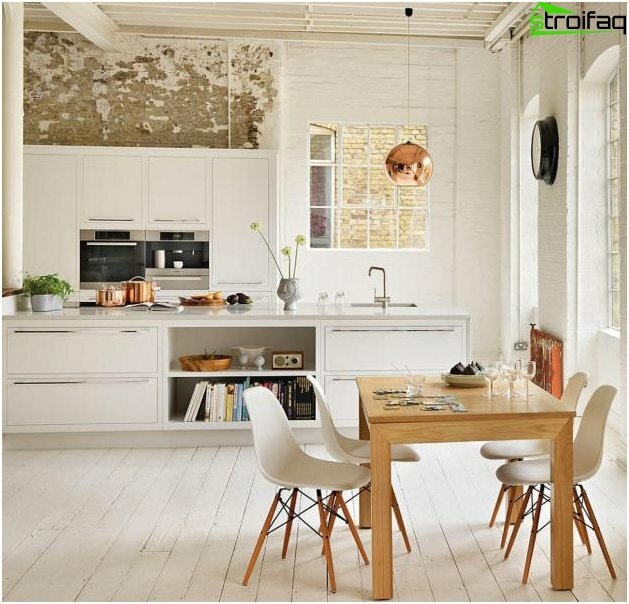 Firstly, if you are planning to use the table, not only for family dinners in a narrow range, but also for holidays - better choose the table-transformer. In the second place, avoid right angles. 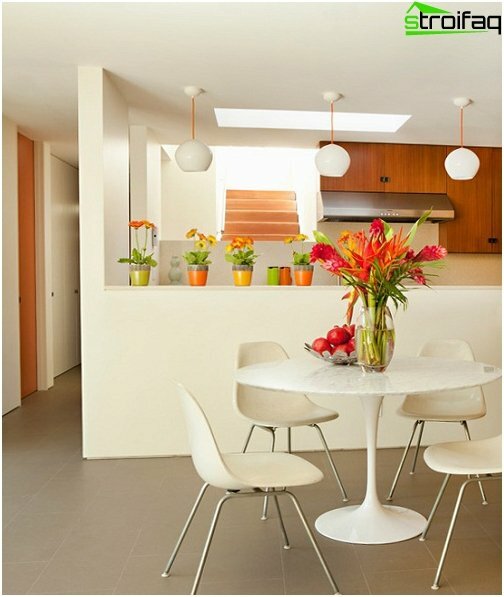 Rounded shapes countertops will allow more secure balance and move around the kitchen. 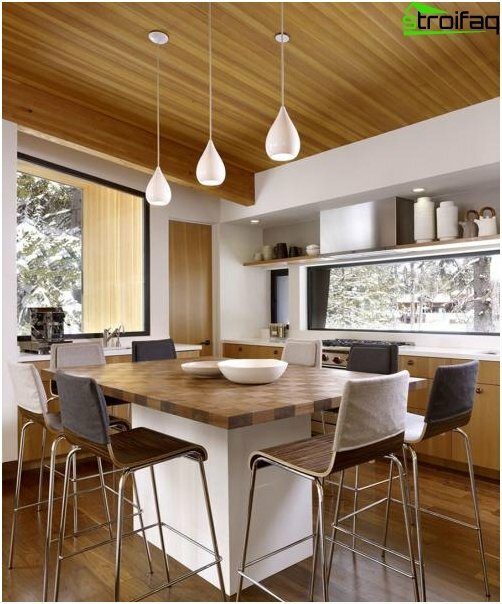 Third, choose a chair with a low back, or better yet - give preference stools. This will postprandial hide them under the table, so the kitchen is room. 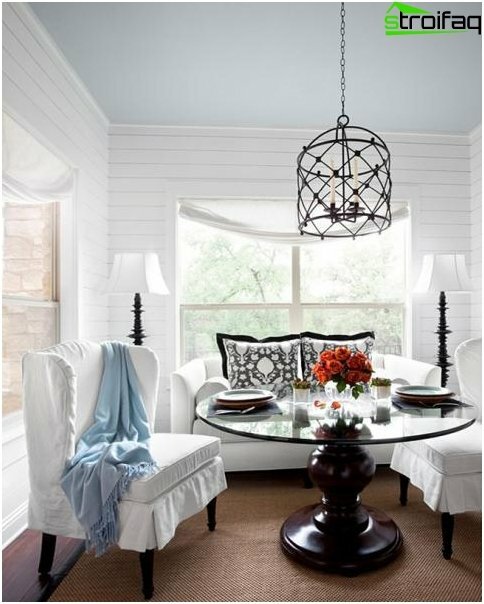 Fourth, give preference to lighter shades that visually eliminates cramped room. 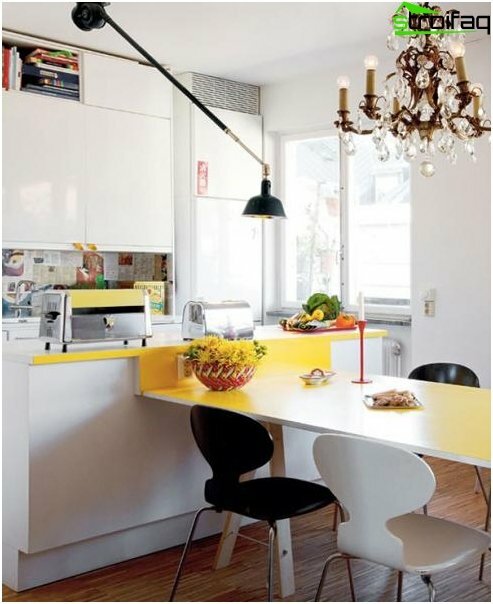 Stylish and original solution for a small kitchen can become a union of a table with a window sill. 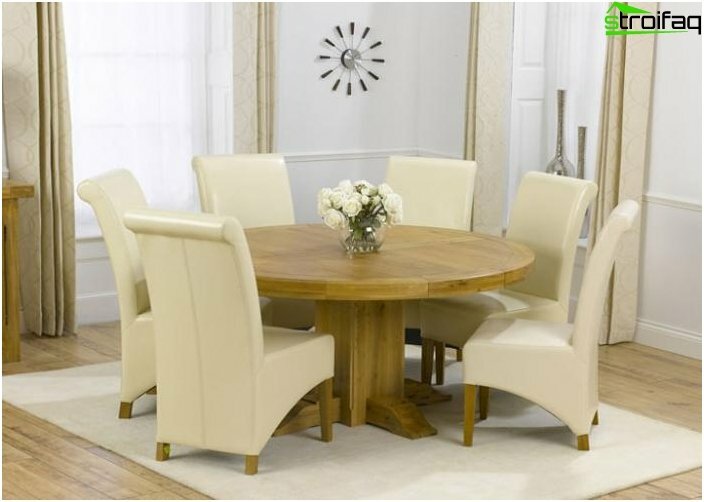 Despite the wide range of furniturestores do not always get to pick the perfect option. It so happens that fits the shape, but does not fit the size, it happens that the size is large enough, but not like the color, etc. For such cases, there is the production of furniture to order, by which all the nuances and suggestions will be taken into account. 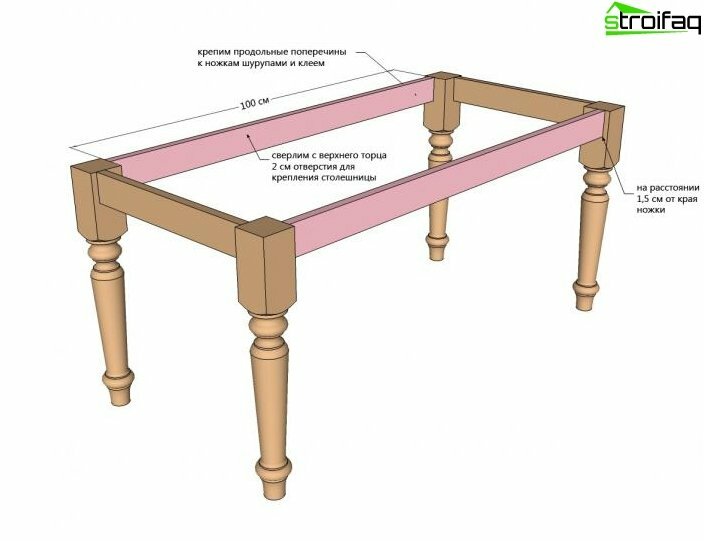 When ordering a table, decide to place the number of seats, materials, shape and design type (if it is a table-transformer). 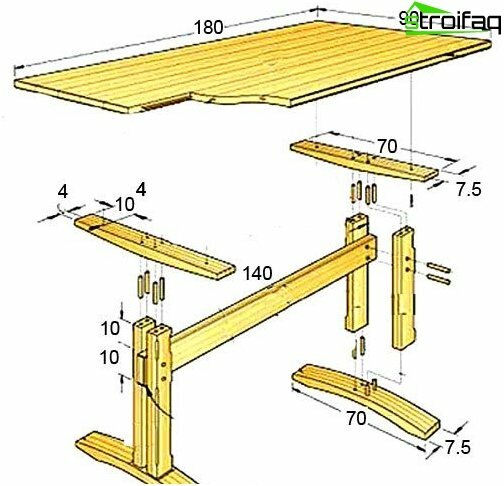 You want to make a dining room table with his hands? Drawings of parts of the future can be created in a special computer program, but on the Internet there is a whole set of ready-made. 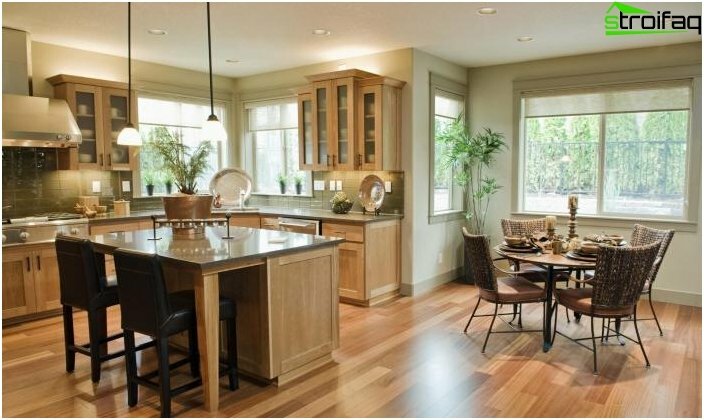 Countertops can be bought ready-made at the store or do it yourself. All materials must be prepared: sanded and polished. After the wooden parts are prepared,you can start assembly. To begin stem connected to the cross members. Please note that you need to drill the legs so as not to pierce through them. 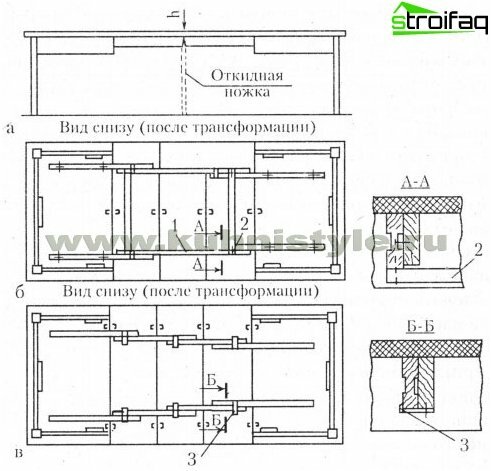 It is advisable not limited to screws and glue connecting further details. Thereafter, based on the finished table top is screwed. 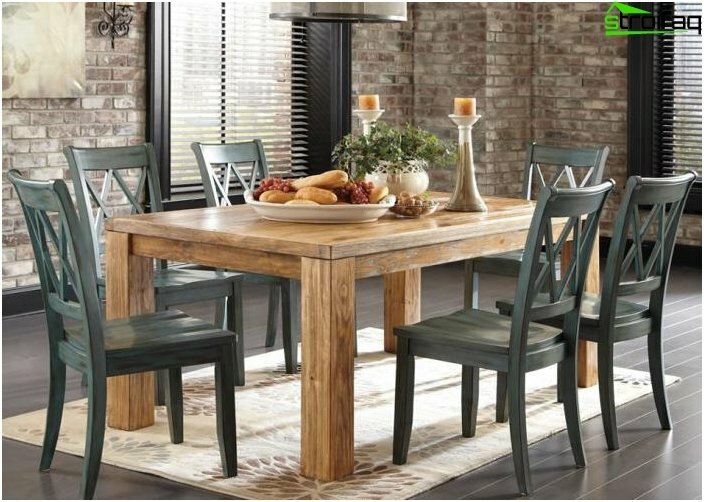 When the table is assembled, it can be varnished or decorate to your discretion.